enrich your work with similes, onomatopoeia, alliteration, personification, and more. This animated adventure is ideal for classroom use as well as individual practice. Although it was designed and tested with students in fourth grade, our team of educators discovered that students in higher grades (even high school and college) benefited from the review of writing tools and how to effectively integrate all of them into a writing passage. We have included a special bonus section: Marko shows you how to proofread your work, and he reveals secrets to score well on multiple-choice writing tests. Plus, you will find free downloadable posters and support material at Marko’s special website. All of the students using this program during our research loved watching it and commented that many of the writing concepts that they had heard about in school finally made sense to them. The animation is spectacular and Marko’s humor keeps students focused. We suggest that the main program be viewed at a separate session from the bonus material. The main Writing Program is 34 minutes in length. Students may review certain tools at any time, easily accessible from the DVD menu. Proofing and Editing, Marko’s bonus material is 37 minutes in length and helps students catch careless errors in their work. Students learn to proof for errors involving paragraphs, quotes, incomplete sentences, subject-verb agreement, misspelled words, punctuation, and much more. Marko the Pencil is played by actor Vic Mignogna, Best Actor 2007, American Anime Awards and voice for many popular video games. Writing Strategies is perfect for boosting performance on any writing assignment, state-mandated writing test, or other type of writing exam. Students gain the skills they need to approach writing with fun and confidence. 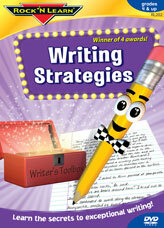 Get started immediately by helping your child or your students learn the secrets to exceptional writing. We guarantee that you and your child or students will love this program. 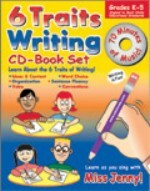 Miss Jenny’s 6-Traits Writing CD-book set is a rigorous, systematic writing program. These user-friendly materials will add some variety and fun to your curriculum as they simplify your life.